At my last solo exhibit back in the spring, I heard two comments consistently from viewers. The first comment was that the show was full of “happy” art. And the second comment was that “this technique would be great for a kid to try”. It has taken me a long time to embrace (and even to celebrate) these two characteristics of my current work. For a long time, I equated “being a professional artist” with “being serious”, dealing with “serious subject matter”, and “using professional equipment and supplies”. And while pursuing a creative career can indeed take some serious work, thank goodness the subject matter and technique can still be full of delight, whimsy and childlike enthusiasm. I am glad my work makes people smile. We could all use a little more happiness in our lives. And I am also glad my materials are often as simple as white glue and tissue paper. These materials take me back to my childhood when I first discovered the creative spark. It feels good to know that my art and my technique can be easily passed on to others, regardless of age. “Green Gecko Making Tracks” is a whimsical mixed media piece that I created earlier this year. Florida life is full of daily encounters with lizards of many shapes, sizes and colors. I see dozens of them daily, and they never fail to make me smile with their skittish little antics. 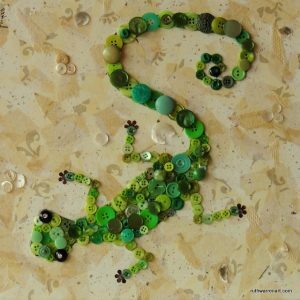 The background of this piece was created using tissue paper collage, and the gecko is a button mosaic. I used one salvaged tissue paper that had the perfect color and pattern to simulate tiny little lizard feet tracks in the sand. Hope he makes you smile just a little today.